Walking though Barnes & Noble today, I had to laugh. 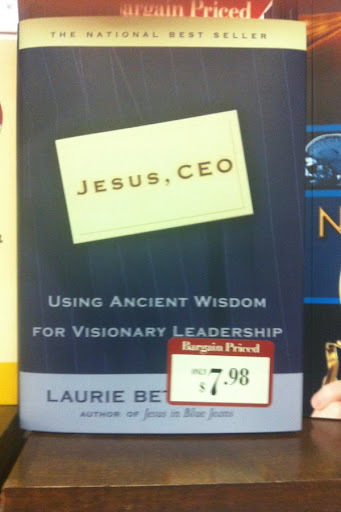 The title of a book on the ‘bargain’ shelf caught my eye as it seems to reflect the essence of my last entry, Corporate Church. Mind you, I’ve never read this book so it may indeed be the best leadership book ever and worthy of being a national best seller. Really, anytime we can learn from Jesus that is a good thing. I guess the problem seems to be we so often create a Jesus in our own image or a Jesus that we are comfortable with. So, rather than God, Savior, Creator, or Sustainer of all things we have Jesus as CEO. Think about what a CEO does and with what he is concerned. When Jesus is viewed through that lens, is it any wonder we end up with corporate church? Here it is. Enjoy. A picture is indeed worth a thousand words.